HandPlus+ high risk gloves are made from extra strong latex with an extended cuff (30cm) for added protection. The textured surface helps grip and the beaded cuff makes donning easy. 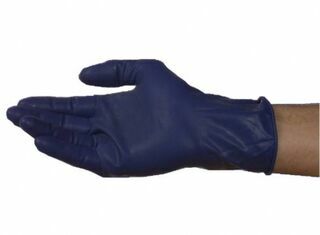 Manufactured to the ASTM D3578-95 specification for Latex Examination Gloves. Blue colour for easy identification, these high risk gloves eliminate the need for double gloving. 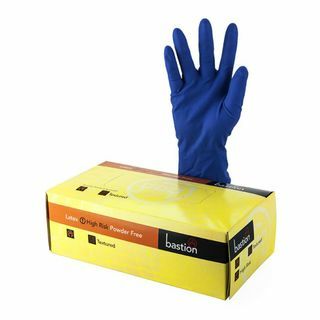 High Risk Latex Blue Gloves Powder Free with long 300mm cuff. Non- sterile for food use. Carton 10 boxes of 50. 200% thicker & 300mm long. Blue high grip version meets FDA & EU standards. industry in 'high risk' areas. Carton 10 boxes of 50 $175.37. Buy 6 or more cartons and only pay $151.88 per carton (can be mixed sizes, but in cartons of each size). Select the number of cartons you want. You will need to need to advise which sizes you would like in comment section when completing purchase or ring us to place your order. Approvals: USFDA (21CFR177) compliant, TGA registered.